WHAT IS THE MANUFACTURING TRIANGLE? While the fabric is the primary component needed to make garments, the expertise and skills of the manufacturer will determine the quality of assembly, the long-term durability, and safety performance of the protective clothing. The Manufacturing Triangle identifies 3 critical elements that the garment manufacturer needs to determine. How should fabrics be positioned so that the structural integrity at each junction of the garment can be maximized without waste or excessive use of fabric? 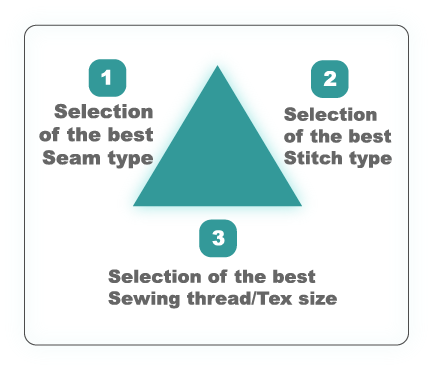 What stitch type meets/exceeds the structural integrity needed for each junction of the garment to meet/exceed the performance requirements? What sewing thread and tex size contributes the best value for factory efficiency, quality, seam efficiency, and economy?